An update: After doing some more reading on this site, I thought I would try having a sort of conversation with whatever it was that was hanging around, and mentioned that it wasn't welcome, and that if it didn't leave right now, I would be taking stronger measures, such as calling in a minister for a house blessing, etc. And whatever it was, has left! livelovelaughter1 wrote: An update: After doing some more reading on this site, I thought I would try having a sort of conversation with whatever it was that was hanging around, and mentioned that it wasn't welcome, and that if it didn't leave right now, I would be taking stronger measures, such as calling in a minister for a house blessing, etc. And whatever it was, has left! I'm glad the solution was so simple! A couple of ideas that popped up in my mind was to utilize methods like placing Camphor at each corner of a room, or in a quincunx pattern, to cleanse and ward off whatever may be going on there. You could also burn Camphor on charcoal. http://www.herb-magic.com/camphor-resin-incense.html. The other idea was to burn some Tibetan Ghost Purging Incense (which has been stated above) around your home. http://www.luckymojo.com/tibetanghostpu ... cense.html. I hope this has been helpful for you. Good luck and may it all work out. I've had great success in clearing out troublesome spirits and keeping them away by making a "tea" of Angelica root and lemongrass, straining it and spraying it around places with unhelpful spirits. Since you've already cleared the spirit, I would nail a holly leaf over each door so that only helpful spirits enter in the future. hi, i wanna ask for help. my friend is followed by a ghost and the ghost hurt him. for example, the ghost made him broke and hurt him physically. i have ordered the cast off evil spell kit and it needs over a month to arrive. so i wanna ask what can i do in this period of waiting the spell kit? I'm so sorry about the ghost. That can feel intimidating. Nevertheless, there are 3 pages here of suggestions. PLEASE take the time to read through these posts. ok i've always known i have had spirits around me and in every home i lived in it's not the house it's me any way my mom was here this Christmas and had took some pics out side of me and my lights ect of the house and there are so many orbs they look like a huge cloud and in one pic there is a face now my self and my children are very sensitive to there world we see them,feel them can hear them ect.but it is very neat when there is photo proof 3 different photo's taken from a 35mm camera.i don't know how to load photos up here if any one would let me know how i'll have my son help me get them on here.i first thought she got dust but i know a orb form dust and there was no rain or snow the elements were in my favor,my house alone is way over 100+years old i live at a cross road not far from water( a river). oh and i live across from a morgue too on the opposite side of the river and cross road.i think you can see the morgue and the crossroad in a couple of pics too. Unfortunately, we don't encourage downloading of personal photos But thank you for offering. And, hopefully, you may be able to get them to assist you in spell work. Blessings I have been dealing with a bad case of shadow people ( evil spirits) and I did a petition candle spell with a black candle exactly like the 6" BLACK CAT BRAND OFFERTORY CANDLE, BLACK in the lucky mojo online store. The spell was to cleanse my mind of negative and evil thoughts created by a shadow person that attached itself to me. I have been battling against the shadow people for months now and doing several cleansing methods herbal banishing spray, smudging with sage and other herbs, using bells, laying down salt, casting circles of protection ,praying to the divine, telling them to leave nicely, smashing a mirror they were using as a portal, doing about seven spells, all have only temporary fixed the situation. All of this stared when I used a santa muerte candle to cast a curse. I have concluded by doing so I opened doors to the spirit world and also recieved the wrath of santa muerte for not being 100% devoted to her and brought spirits home with me. When the candle finished melting a pair of legs and feet formed from the wax drippings. I wish I could include a picture because I have never gotten such a good wax dripping result before. About 1/2 inch of candle was left and I thought it has burnt down but it remained in the holder for it. I dressed the candle with my homemade banishing oil and filled the holder with salt. Does anyone have a meaning for a pair of legs with feet forming from wax dripping. I have my own theory but would like advice. Also I would like to know if anyone has any suggestions to rid myself of this evil. I do not have enough funds to get an AIRR reading but I do have my own deck of cards and I am very skilled at it. It seems the shadow people create blocks in my mind and energy so I can never 100% use my power my workings are always 3/4th ways finished. I desperately need help. Thank you. I am so sorry that you are experiencing all of this. However, I do not believe that working with Santa Muerte would do that. It's so very difficult to know what is happening to you and how to help you without a reading. So, I will merge your post to the appropriate subforum to give you some ideas on what to do. A ten minute reading is $10.00 from many people at AIRR, but if you cannot afford that, you could sign up for a free reading at the Lucky Mojo Hoodoo Rootwork Hour Radio Show. I would also HIGHLY suggest that you see a local Clergyman (a leader of your Religious faith) for some help (as soon as possible). They are experienced with situations like this. They can sit down and talk to you and even assess the entire situation. Hi guys. Weird things have been happening in my house off and on for the past few yrs. For the past month or two during the waning moon phase, weird things have been happening. My daughter heard someone growl at her, I felt someone in my bedroom creeping up on me as I slept and when I turned I jumped as if someone was here, a knife just suddenly went missing, my TV that worked perfectly fine just died out after I left the house for 30 mins, and lastly I was on the phone with ny empathic/psychic friend and heard my own voice tell her something and she responded (clearly it wasnt me). She unfortunately is not helping because she keeps talking about it and I believe when you do that it makes things worse. She literally wont leave it alone, and telling me tjat since my daughter has psychic/empathic abilities that she may have created a Poltergeist. I too have such abilities but have chosen to ignore these abilities due to fear. Anyways, I have been burning banishing incense and praying the 66 psalm around my home but now due to my also having an anxiety disorder, I am extremely paranoid in here. Last yr I was told by a reader to place the bible under the bed with a pair of scissors under it, and I did that for a while, but had to remove it to clean up, and didnt put it back like a dummy. The question is. what can I do?? I want whatever is here GONE!!! If you feel the house is haunted then you should do a cleaning of the home followed with a peaceful home. If the spirit wont leave many people have success with making a spirit jar or box that they keep on the mantle to honor the spirit without it disturbing things. I had a spirits in my house and finally had a "sit down" where I relayed the emotional feelings I got from the spirit, my intention with the home and to honor it and to do so as a team. Never felt the feeling again. I have also had weird abnormal things happen like lights turn on without reason or in rooms not used. Its creepy I agree but you have to trust your spirit and listen to what to do. A good cleanse will help with that. When I was a kid I was taught to take a white candle set it in a white dish with vinagar and white pepper to remove a spirit from a room. As it burns you pray to cleanse the room. Hope it helps! j82 wrote: If you feel the house is haunted then you should do a cleaning of the home followed with a peaceful home. If the spirit wont leave many people have success with making a spirit jar or box that they keep on the mantle to honor the spirit without it disturbing things. I had a spirits in my house and finally had a "sit down" where I relayed the emotional feelings I got from the spirit, my intention with the home and to honor it and to do so as a team. Never felt the feeling again. I have also had weird abnormal things happen like lights turn on without reason or in rooms not used. Its creepy I agree but you have to trust your spirit and listen to what to do. A good cleanse will help with that. When I was a kid I was taught to take a white candle set it in a white dish with vinagar and white pepper to remove a spirit from a room. As it burns you pray to cleanse the room. Hope it helps! Thanks for replying and this helps but according to my psychic/empathic friend it means to scare and harm us so a sit down will not do anything for this situation. I also want to add that I live in an apartment complex so Idk if I bought this thing here, created it, or if someone in the complex has caused this. Either way I just need us overall protected. Bestest, read up on the Tibetan Ghost Purging Incense - I haven't had to use it yet, but folks on here swear by it. Pine resin with Frankincense is good too. Also, put camphor squares and salt in the corners of your bedrooms and sprinkle salt in your sheets so you can get some sleep. Uncrossing work on everyone and the house may help too. Put the Bible back in the bedroom, along with a glass of water ( which you throw outside off your property each morning ). When the bad is gone ... cleanse, then seal, then protect ... and do that from now on. Just some ideas ... hope it helps. Keep us posted. MoonBreath wrote: Bestest, read up on the Tibetan Ghost Purging Incense - I haven't had to use it yet, but folks on here swear by it. Pine resin with Frankincense is good too. Also, put camphor squares and salt in the corners of your bedrooms and sprinkle salt in your sheets so you can get some sleep. Uncrossing work on everyone and the house may help too. Put the Bible back in the bedroom, along with a glass of water ( which you throw outside off your property each morning ). When the bad is gone ... cleanse, then seal, then protect ... and do that from now on. Just some ideas ... hope it helps. Keep us posted. Thank you sooo much for all your help! I have really been worried and losing my mind with this. thank you! Wish I lived near you. I'd come over and clear it up for you. You got some good advice but.. Anyway, also please read all the posts on these 2 pages for any additional ideas. And don't let the entities get to you. If you feel like they are making you uneasy, don' t let them no that. If they are negative entities, they absolutely HATE laughter and happiness. Sing a lot around the house. laugh a lot. Last week, I was drifting off to sleep in my bed. An ex lover popped into my mind: a memory / vision of us kissing. Then, I meant to open my physical eyes, but instead my "spiritual eyes" opened and I saw a semi-translucent black figure was laying over me. It propped itself up as if in mid-pushup and was shaped like a tall, muscular man. It had no eyes or facial features. It moved like a human, but it looked like a charcoal sketch. Before I could even be startled, this figure yanked me out of my body and threw me off of the bed without regard or looking back. I landed on the floor. I said something to rebuke it ("spirit of _____ I rebuke you"), and it disappeared. I woke up in my body, suspecting that this really happened in the spirit and was not a dream. I also felt that my pleasant memories of this living, breathing ex lover have been used as a gateway by this malicious being. God knows what this figure has been doing to me that I don't recall. I think this entity is responsible for at least some of the paranormal activity in my life, which has isolated me from friends and family who don't experience it. So, I did a floor wash and the house feels lighter, emptier and safe. I plan to have a reading done next week, and then I will place a Lucky Mojo order. Until then, does anyone have experience with these dark entities? I've had my own experience with one of these. In fact, he was attacking a few women in my apartment building (and we resembled each other). I got rid of him but then had to help the other gals get rid of him too. BUT, they are not that difficult to get rid of. Yes it looks like it. I have to say, mopping up even a portion of the house I live in got things moving in the right direction. I used things I had on hand: a little ammonia, urine (don't ask, and I won't tell), salt, sugar, and an assortment of essential oils. Within hours of mopping, the person I live with (who has addiction issues and is sometimes abusive) suddenly had to leave on a trip, indefinitely. That never happens. This gave me time and opportunity to anoint the home with oil, to forcefully expel any dark entities while reciting scripture, and to use some old forgotten incense from an orthodox church. The feeling in the home totally shifted. As for the succubus, I do suspect it has been lurking around me for some years. Sometimes I wake up and there are large red hand prints on my chest or belly. I have photos of the marks. The fingers are very long, and I cannot replicate them on myself. It's good to know they are repelled so easily. About a year ago I got a reading and was told that someone had sent a spirit to destroy my life. I was told this was all out of jealousy, this person wishes she could have everything I have. My life isn't peaches and cream by no means I go through all the ups & downs like others. So people should be careful for what they wish for. This spirit was sent to strip me of everything, make me lose all that I own business, finances, family, etc.. Since then I lost the business I had for over sixteen years, & in my household everyone is fighting with each other. My mother is in her late seventy's & every year she comes to my house for thanksgiving and Christmas, but when she came this year she asked me what was going on she said she didn't fell comfortable at all in my house and it did'n't fell like a family anymore. I could see if a arguement or a fight took place to make her feel this way but nothing happened. I think she was feeling something was wrong as well. I had a good financial stability up until now my savings & checking accounts are totally empty, my credit cards are all maxed out and my rent and car note is in arrears. The job I have now requires me to use my car on a daily basis, but now that's acting up. Yesterday made the third or fourth time I took my car into Toyota to see what the problem is and each time they thoughtly check the car & they tell me they can't find anything wrong with my car. But all my dash board lights keep coming on. I also was in two car accidents back to back in the same week. I have taken baths with nettle, agrimony, chamomile van van,& block removing products and then afterwards took baths for good luck & money. I have made a money lamp and lit it but for some reason it won't stay lit it goes right back out. I also lit st expedite, bayberry & fast luck candles, These candle burned slow and were black around the top. I have mopped from back to front as well as smoked the house out. I do this on a regular it gets just a little better for a minute then when I think things are gonna turn around for the better I'm right back to where I started. Can someone help me ? How can I stop this spirit from following me and destroying my life? Is there anything I can clean my car with and put in my car for protection. Also what can I do to prevent my lamp from going out, I just came to the conclusion that it' the spirit. The prosperity and cleansing work you describe sounds good and thorough -- but I don't see any PROTECTION work! Your opposer sounds capable and persistent, so this is especially important. Why not sign up for the radio show and get a free reading and rootwork advice by THREE honest and gifted rootworkers? If you don't get picked for tonight's show, you'll be able to sign up for next week's show by tomorrow. "Something attacked me while I slept last night. I could not breathe and my heart was racing. I couldn't even scream for help.... I even started pounding on the wall"
I have him burning an archangel Michael candle, a glass of water in the corner of his room; and it has gotten worst. There were three room mates and one moved out...since this evil entity has been messing with him and his room mates and their friends. They are all 27 and have parties at their house;and other friends have mentioned to him the place is haunted when they spend the night. First Id say he needs to move. But he also needs to be cleansed and a fiery wall of protection mojo on him. Id also get a cross and sprinkle holy water. Really consult a professional before taking on something that evil. Thanks for you input. I gave him some fiery wall of protection, anointing water made by priestess, and have him asking Archangel Michael and God for help with this one and he is burning the Archangel Michael candle. I also gave him some Run Devil Run bath wash to bath in. I had him put a glass of water in the corner of the room; and it was half gone the next morning. So this is a demon entity and not a ghost or spirit. What I'm really trying to find out is there anything I can do to ward of this horrible spirit and stop it from following me around & get it out of my house. I worked my behind off to make money on this job and like I said Everytime I start progressing something happens to set me back. It could all be just coincidental but now I started making more money and my car just started going haywire & they can't find anything wrong with the car yesterday I took my car back to the dealer now for the 5th time. I need a remedy to clean my car and protect it & to keep a distance between me & this spirit, or get rid of it once & for all. How can I prevent the light from going out on my lamp? There's enough oil in the lamp & no herbs or anything is blocking the fire from lighting. Destiny, as Miss Michaele suggested try stepping up protection. In similar circumstances, I have found prayer to be quite helpful. There is a spiritual protection prayer, short yet powerful where you plead the Blood of Jesus on yourself, family, pets, health, finances, home, car, etc. and ask that God send angels to form a hedge of protection on your home - above, below, around, and on your street. Then ask that God break all plots of the enemy against you and yours. It goes something like that ... but you get the point - PRAY. Did you find, or were you given a gift right before all this bad started? Did you buy something at an antique shop or estate sale before all this started? Sometimes the bad spirit can be attached to an object - a cursed object. If this is the case, you need to destroy it off your property. You said a jealous person sent this to you ... so I was wondering if it came as a gift??? It is common to give a cursed object to someone as a gift, this is why I ask. If this is the case, as long as the object stays in your home, that thing will be able to keep coming back on you. A cleanse will help for a while, but then things will get bad again. Can you remember getting something before all this started? Can someone from LMJ please answer my question or give me their opinion. My son said some lady came into his restaurant on Monday and asked him if he was okay. He said, yes, fine why? She replied because you have something attached to you on your left side. Interesting after my last post and his sleeping issue. This is very difficult to ascertain without a reading. There's no way we can tell what type of entity this is on the forum. I'm not sure what else he could do at this point except to move, then cleanse and protect himself. But as long as he's living with others, and people in and out of the house all the time,eradicating this thing will be difficult. Everybody would have to be focused on getting rid of what's there and not have people coming and going. I would also have him see a physician to make sure that he is Medically OK. I'm so sorry that this is happening to your son. Starcaster, Miss Aida is right - we don't know enough about the situation to give detailed advice. You need to get a reading, or one for your son, to determine WHAT he is dealing with ... then develop a plan of action to deal with it. Some things linger beyond a simple cleansing and may require bringing in outside help. I will say this - when a stranger comes up to you out of the blue and says something like that so "on target", that is a message from God. Your son has a problem, and this woman could see it, and tell him it was on his left side. Did she describe what she saw? Did she give him any more information? You and your son are calling on St. Michael for aid, and your son got a message "something is attached on your left side". You need help. You need a reading. Like I said to Destiny, there are some short, yet powerful protection prayers that will help protect him until this situation can be resolved. A humble, heart felt prayer to God for help has power. Pleading the Blood of Jesus has power. Also, I would go to a Catholic Church and get some Holy Water to have on hand - ask the priest to bless a St. Benedict Medal for your son to have on his person at all times ( this medal protects a person or place from evil ). Maybe he could even get some Church incense to burn until the Tibetan Ghost Purge Miss Aida mentioned could arrive. However, once you get a reading and know WHat you are dealing with, you will know better which products to order which will have the most benefit in helping your son. I've said a prayer for your family. Keep us posted on how things are going. Thank you everyone for you help. I will keep you posted! This page also includes protection amulets that the child can wear. Athena1, The info Miss Aida sent will give you a better idea of things you can do. I would like to add that candle work can be done for people who do not live with you; in fact it is done all the time. For example, if your child is off at college and calls to let you know they are having problems - you can carve their name into a candle, anoint it with Protection or Cast Off Evil Oil, and pray that they will be protected. You also could employ an amulet, as Miss Aida suggested. Have a priest bless it, or fix it yourself by smoking it with Protection or Uncrossing or Cast Off Evil Incense then put a drop of Protection Oil on it and pray over it - then mail it to your child and tell them to wear it! This would help protect them until some sort of solution could be reached on cleansing the actual property where they live. These are just some ideas of things you can do when the child is not actually in the house with you - you can help people from a distance. Hope this helps. My mom has a kind of sixth sense because our passed away relatives often "borrows" her body on their death anniversaries. They take over her body and controls her speach and behavior for a short time. My grandmother tells her how much she appreciates her, my passed away sister cries and tells us she misses us and that she's waiting for my mom and dad, my uncle wants to talk to his son, my grandfather visits and drinks a half litre of alchohol (my mother can't tolerate alcohol but woke up without being drunk) etc etc...You name it. As far as all of your other questions, this is way too complicated of a topic to discuss on this forum. At the moment, a friend of mine is dealing with a spirit that she has know since she was a child. This spirit has become a very large part of her life and while they seem to enjoy each other's company, at times this spirit becomes very angry with her. After a long talk she still refused to get rid of the spirit, but she is willing to find out a way so that it cannot harm her. This is a tall order! She wants to keep the spirit but wants to control its behavior? Not an issue for this forum as it is way too complicated and would take an expert hours upon hours to teach something like this. If I am going to allow a ghost to stay with me, it is under my terms or else it leaves immediately. No questions or negotiations. One false move and it is OUT! My advice for a layman? Get rid of it (as you had already stated)!!! Thank you very much, Miss aida. You were a great help. 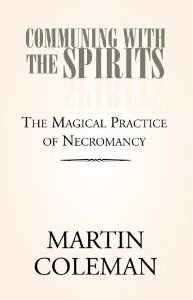 There is some information on how to keep a spirit but control it in Martin Coleman's "Communing With the Spirits," but, as Miss Aida said, it is not simple! My workplace is cursed. I've done the divinations, and had 2 friends do divinations. They did pendulums, I did pendulum and tarot. The pendulums all responded "'yes" to the direct question, "Is (name of tv station I work at) cursed?" During my tarot reading of the situation, The Tower jumped out at me while I was cutting the deck. That's very apropos, because our tv station's transmission tower got struck by lightning twice in the past week. That's very rare-- normally we get struck once every decade, and only during hurricanes. And usually, when it happens, there are no real consequences because the lightning protection system keeps the electricity from going into our equipment. This time, it just fried a $400,000 control room full of brand-new equipment, and it's costing us tens of thousands of dollars in missed programming because we can't get our satellite feeds working. I don't want to bore everyone with all the other reasons this situation is unnatural-- but if anyone's interested, I got about another 4 paragraphs of reasons this can't happen. For everyone else-- how does one uncross and protect a workplace? I'd absolutely love to get in touch with an AIRR worker, but I have 20 bucks to my name right now, so what I need is a working I can do myself with supplies from the grocery store. I've got white emergency candles and vigil candles out the wazoo, if that's helpful. But no, I can't burn them on the property. No flames or smoke on the property. I am so very sorry that this has happened to you. But, unfortunately, we only help people with their Lucky Mojo products. Also, I am going to move your post over to a thread that deals with situations like this. You may gt some ideas. Hi everyone, this is my first post, I actually wrote it out already but it was soooo long I decided to start again but keep it short, basically my older sister has always disliked me, she has an absolute nasty husband also, she has always claimed to be a witch and her husband used to have wizadry books, I believe one or both of them are sending something natsy to damage my life. Ever since he has come into the family our family has had bad luck and become distant, I have dreams of demons, really horrible ones, there has been a lot of deaths, especially pets dying of cancer, a lot of bad luck happening, I sense something evil around quiet often, sometimes I feel it puts pressure on and around me and something negative follows shortly, me and other family members have seen dark figures and a couple of other family members have mentioned/hinted since someone came into the family things have taken a turn for the worse. I have questioned weather this is meer coincidence for years but this morning I found a hidden black cross in the bathroom, no one living in the household has put it their. Someone else did, I need help finding out what has been sent and how to get rid of it. This sounds pretty serious so I recommend getting a reading as soon as possible. I was wondering if anyone would be able to tell me what are some signs to indicate that there is a ghost/spirit around you? and do ghosts spirits imprint their faces in certain objects around people as well? I don't want to sound as if I am crazy but I sometimes think that I see the faces of a ghost or spirit around certain objects around me as well. Oh, My. There's too many signs to chose from and be able to discuss on the forum. But, my educated guess is that if you're seeing faces, there's something there. However, they might be good Spirits. It's difficult to tell on the forum. 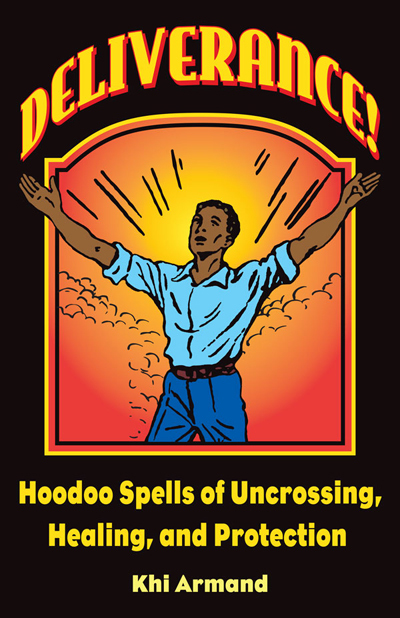 I Apologize in advance if this thread is inappropriate, but I need some advice on how to rid someone of an evil spirit. My ex boyfriend has cancer which has spread from his liver to part of his bowel and kidneys. He then moved to another country so he can get treatment. Thing is, he started acting really aggressive and saying hurtful things.to drive me and my best friend away, since we are the only ones who were actively trying to help and support him. Things took a turn for the worse, and I decided to have a spiritual consultation in an umbanda house in which a light spirit told me my ex is under heavy influence of an evil spirit who is bending him to his will, sucking his energy and making the cancer spread. It is also driving him purposely away from me and my friend so he can't get help. The light spirit gave me some instructions and was very adamant that we are the only ones that can help him, problem is that I don't think that only praying will solve this. Is there anyone who can tell me what to do, additionaly? I've been thinking about sweetening him with a honey jar so that there's at least some way of making him not ignore me, and I also plan to start some heavy cleansing and protecting work on myself because the spirit is trying to attack me too so that I will be discouraged and give up on helping my ex. Never doubt the power of prayer! Products that come to mind are cast off evil, to cleanse him from this spirit. You should wear fiery wall of protection, and petition st michael to protect you and him. You can make a doll baby of him if you have a personal item and cleanse the doll baby, then put it in a circle of salt and wrapped in white linen. I would also encourage you to contact an AIRR member and get a reading on the matter since this involves evil spirits and you fighting it off. You may also want to do healing work such as using all heal and healing oil with john the conquor oil. Hi, j82. Thank you for your reply. Yes, I'm doing some heavy praying for him every night. Prayers have helped me quite a lot in the past, so I never doubt them. I don't have a personal item of his, though I do have a sweater of mine which was with him for a couple of weeks until he moved away. Would that be enough? Regarding petitioning St Michael, how would I do this? Again, thank you a lot. Just click the link and read the page. Then, if you have questions, ask them in that thread. Thanks! You can leave a prayer or petition, or you can pray for another person. Visitors: Submit your Prayer Request by clicking the "Enter Your Prayer Request" link on the page. Members of the Crystal Silence League from all over the world will pray for you, morning, noon and night. Whenever a dedicant of the League sees your prayer online and holds you in thought or prints your prayer request to use as a focal point for work with the Crystal Ball, you will receive a brief email that tells you "The Crystal Silence League Has Prayed for You!" 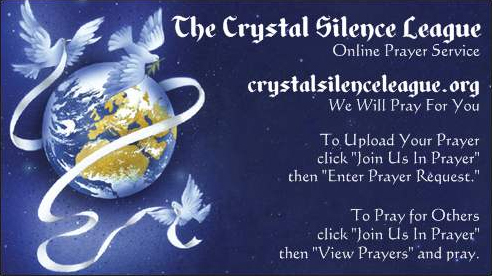 Members: When you pray for these supplicants online or print their prayers out to place beneath your Crystal Ball, click the link below that says, "Click here to tell [Name] you prayed" and a brief email will be sent to them from this site, informing them that a dedicant of the Crystal Silence League is praying for them. Lift them up and let them know you care! Remember, James 5:16 says, "...pray one for another that you may be healed." Feel free to share these links via Facebook, Twitter, or other social media. You may use any of these links to help people with emergency or crisis issues, to assist those who have no money for a reading or for spiritual supplies ("Prayer is always free at the Crystal Silence league") and those who are unwilling to commit themselves to getting a reading, practicing rootwork, purchasing a spiritual candle service, or hiring a conjure doctor. Well I do not think that from the signs that I see that they are bad spirits. It just looks like 2 faces have been drawn on my driveway & it almost looks as if they were drawn or dusted into the cement with chalk or powder. One of them actually looks like me with highlights in the front of her hair beside her face and the other one looks like a skull & I think that that one's a male. I have a camera set up to monitor my driveway to keep me & my dogs safe so I always look at them when there is no other car parked outside. Whenever I have to end up moving my car the faces disappear. I have at some point dusted the driveway with the Fiery Wall of Protection sachet powders and then I have also thrown bath water with some Uncrossing bath crystals in it. So maybe the faces appeared after the different protection sachet powders and bath waters that I have used in the past but that was a very long time ago. Anyway, can you give me the specific name of the book you are talking about so that I can order it please?? I just wanted to stop by to thank Miss Cat and J82. Your advice on praying to Saint Michael was spot on! After two days of fiercefully ignoring me and my best friend, my ex finally talked to us a bit after I started my nine day prayer yesterday evening. This is an awesome sign that things are going to work out ok. Thank you both so, so, SO much! Lovemydogs wrote: Anyway, can you give me the specific name of the book you are talking about so that I can order it please?? Yes, it's amazing. I know that this will take patience and time, but it is a big step forward to have him talking to us again, even though he speaks very little. I have a slight issue. I will soon be working as a receptionist at a funeral home and my mother has scared me . She warned me that spirits often stay around in the funeral home; sometimes to see who's visiting them, and sometimes to just be near their body. The statement that scared me the most was when she said "sometimes spirits can latch on to you. You have to live with your pa pa because i dont want any spirits " Im not afraid of being in the funeral home, i just dont want anything to come home with me. My question is, What can i do to prevent spirits from latching on to me. Will i use Fiery Wall or just carry salt in my pocket? I doubt that any spirits at the funeral home will be evil and want to harm me, but i just dont want spirits attached to me. When you are leaving, just spray the crown f your head and tell them that nobody is welcomed to follow you. They do not have your permission (many times, Spirits will misinterpret nothing being said as a "welcome". So, make that perfectly clear to them. Do not get friendly with the bodies/Spirits And NEVER show fear! Thank you so much Miss Aida !